San Francisco (Obama.net)- When the citizens of Tucson, Arizona went to their local grocery store Saturday morning, they were not expecting what was to come. While they were expecting to simply pick up their groceries to stock their kitchens and feed their families, instead they were involved in headline news as a shooting broke out. Jared Lee Loughner is the subject in question who came into the store Saturday morning with a 9mm Glock and pulled on the trigger relentlessly. The twenty-two year old man is now in the custody of the local police force. In total, eighteen individuals were hit by bullets. Six of those people were killed by Loughner in the attack. Another twelve were injured by the gunfire. 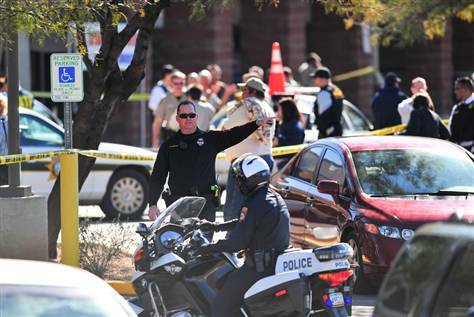 Later on, the Pima County Sheriff’s Department announced that Gabrielle Giffords, a Democratic congresswoman from Arizona was one of the twelve people injured. Her injury is severe though. The forty year old is reported to have been shot in the head. Dr. Peter Rhee said that she went through surgery because of the bullet going through her head and brain. She is now in critical condition at the University Medical Center located in Tucson. Dr. Rhee said that he is “as optimistic as it can get in this situation” and that she will be under heavy supervision to make sure she has the best chances for recovery. Five of the others injured by the gunshots are also in the same hospital in critical condition. Another two of the individuals who were injured are now in Northwest Medical Center. President Barack Obama also told reporters that John Roll, the Chief Judge of the United States District Court in Arizona was one of the six people who lost their lives on the sad morning. As further details were released, a little girl of the age of nine was also announced as one of those who were killed by Loughner. Members of Congress and federal officials have been told to be cautious and take “reasonable and prudent precautions regarding their personal safety and security,” according to the United States Capitol Police. President Obama also has sent FBI agents to Arizona to assist in the investigation.